Tetyana Troshyna, a private entrepreneur from Kyiv in central Ukraine, took part in the tour about non-timber forest products. Photo by U.S. Forest Service. There were a number of other ginseng indicators in that particular cove on the Pisgah National Forest. 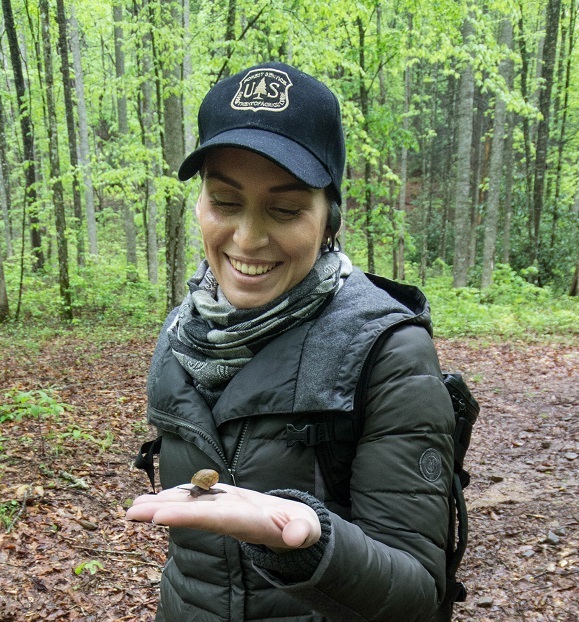 However, the rarity of ginseng suggested to Kauffman and Jim Chamberlain, a Forest Service Southern Research Station scientist, that it had been poached. Chamberlain and Kauffman, along with Forest Service International Programs specialist Shelia Slemp, were in the midst of a 2-week tour that spanned the U.S. They were accompanied by nine Ukrainian natural resource professionals who were interested in how non-timber forest products (NTFPs) are harvested and used in the U.S. The tour was supported by the Foreign Agriculture Service’s Cochran Fellowship. Ginseng is one of the most economically valuable NTFPs – in 2013, a single pound of dried ginseng root could fetch $1,000 or more. Although prices have fallen since then, the slow-growing perennial is highly vulnerable to poaching. Because ginseng is protected by the Convention on International Trade in Endangered Species (CITES), there are steep consequences for poachers, as well as anyone who purchases poached ginseng from them. Some companies, such as Herbal Ingenuity, refuse to purchase, process, or sell American ginseng because of its rarity. Herbal Ingenuity, which is based in Wilkesboro North Carolina, allowed the Ukrainian group to visit its processing plant on May 4, and Ed Fletcher, the director of quality and sustainability, led the group on a tour. Some of the Ukrainian participants, including Leonid Osadchuk, the chair of botanics and non-timber resources at the National Forest University in Lviv, Ukraine, were especially interested in quality control. Fletcher explained that Herbal Ingenuity ensures quality by working closely with farmers and being involved in their cultivation process. In both Ukraine and the U.S., the sustainability of wild populations is often unknown. Scientists do not have baseline population data for black cohosh, blue cohosh, bloodroot, and many other NTFPs – and below the surface of the ground, the amount of unseen root material is even more of a mystery. The only exception is black cohosh, as Chamberlain recently developed a model that uses black cohosh foliage and other aboveground parts to estimate root mass. Chamberlain is developing similar models for blue cohosh, goldenseal, and wild yam. Read the first article about this program.